Visitors travelling from Florence to Volterra, or to Monteriggioni and Sienna, via Poggibonsi often overlook Colle di Val d'Elsa because they pass only the modern part of the town. 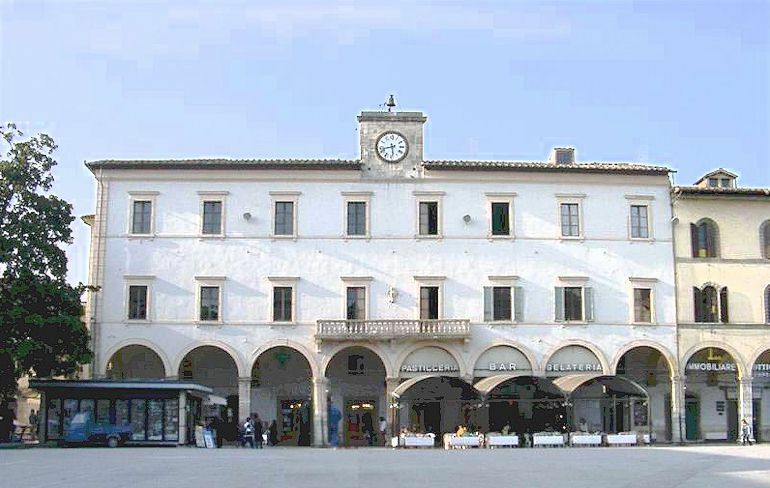 In fact, Colle di Val d'Elsa has a small but attractive old town with two important provincial museums, the Museum of Civic and Religious Art and the Archaeological Museum, as well as quite a good Museum of Lead-Crystal Glass. 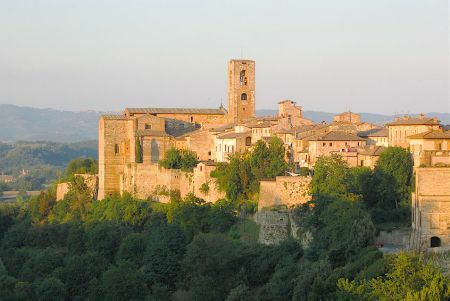 Colle di Val d'Elsa is a town of 20,000 located above the valley of the river Elsa on the route of the ancient Via Francigena, the mediaeval highway frequented by pilgrims and merchants travelling to Rome from Canterbury and elsewhere in northern Europe. 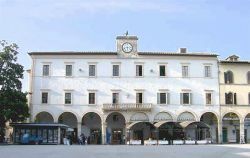 The town originally developed as three independent areas: Borgo di Santa Caterina, Castello di Piticciano and Il Piano. Borgo di Santa Caterina and Castello di Piticciano are the older of the three and were inhabited by the ruling families. They are situated on the same east-west ridge and, separated by a large saddle, they dominate the valley floor where the third "borgo", Il Piano (the plain), is located. Il Piano now has a modern urban structure built specially to accommodate manufacturing activities. Click here for things to see, accommodation and everything you need to know about the Chianti wine territory. 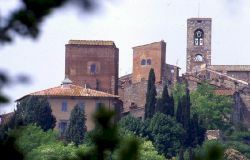 Major archaeological finds in the area date as far back as the 4th millennium BC, but the first documents mentioning Colle di Val d'Elsa are 10 C, as is typically the case for Tuscan settlements. Towards the end of the 12 C, the town gradually acquired political autonomy and a political identity of its own: the first documented municipal statutes date to 1307. 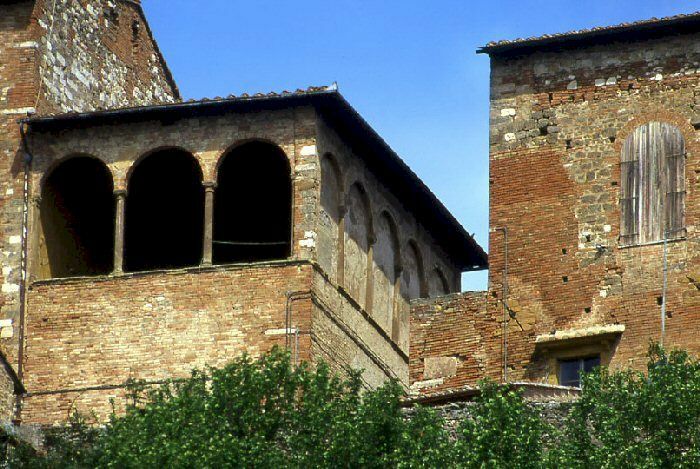 Even in the mediaeval period, the town covered a large area including Il Piano which extended along the route of the original "gore" (water channels). The gore are the artificial water channels supplied by water from the river Elsa that were built, beginning in the early 13 C, to make provision for trades that relied on water as a resource, such as flour mills, paper mills and fulling mills. In this sense, the gore were a crucial factor in the town's economy, fostering the development of industrial enterprises. During its long history, Colle di Val d'Elsa has been the setting for frequent military events. Among the most famous of these was the battle of 1269 between the Guelfs and Ghibellines, which had significant repercussions for the political geography of Tuscany, and the siege of the troops of the Duke of Calabria, which took place in 1479 in defense of the territory of Florence, which led first to serious destruction, and later to further reinforcement of the system of fortifications. During the 16 C, Colle di Val d'Elsa was still part of the Florentine sphere of influence, but was gradually gaining independence, mainly thanks to the de Medici family and to the local ruling families who handled the town's administration. Following the formation of the grand duchy of Tuscany in 1592, a Bull passed by Clemente VIII created Colle Val d'Elsa the seat of a new diocese. In the 17 C, the Usimbardi family introduced glass production into Colle di Val d'Elsa. The paper industry was replaced by the new iron and glass industries. The production of glass evolved into lead-glass crystal production and this became the principal industrial activity of Colle di Val d'Elsa, which became known as the Bohemia of Italy in the 19 C. Today Colle di Val d'Elsa produces 15% of the world's crystal.